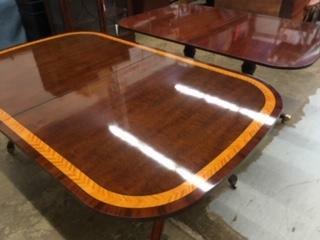 Beautiful Inlaid Dining Tables Large Enough to Sit All of Your Guests! Two Gorgeous Banded Double Pedestal Dining Room Tables arrived on our dock yesterday, April, 5, 2019. Whether you prefer the simple Banding on the Hickory Chair Table or the contrast banding on the John Widdicomb Table, your guests will Enjoy Dining in Style at these fabulous tables! 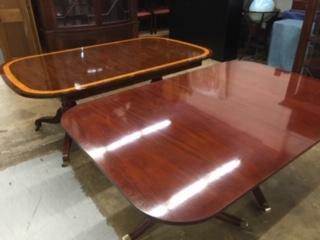 Tables like these are likely to sell right from the back room. Don’t delay, we are open from 10 am to 5 pm today! John Widdicomb Banded Dining Table has 4 leaves and opens to 10 feet, 7 inches! Banded Dining Table from Hickory Chair opens to 9 feet, 8 inches!